As a tribute to Lexikaliker’s fantastic “Basteln mit dem Lexikaliker” series I want to show you today how to make simple point protectors for your pencils. Lexikaliker had two different posts about point protectors (a simple version (Google translation) and an improved version (Google translation)). My version is not as good as Lexikaliker’s, but you will usually have all the material necessary at home. Actually… my point protector is so simple, you probably thought of it yourself somewhen in the past. If you have not looked a Lexikaliker’s handicraft articles yet, you should definitely have a look, especially at the one where he turns a pencil into an electric, musical instrument (Google translation). For this simple point protector you need some old paper and sticky tape. I usually use the reverse side of calendar sheets to make notes, but the sheets of this Dutch calendar (see first picture) with Donald Duck comics are printed on on both sides. As I cannot use them for notes I will use them to make the point protectors. Maybe you also have some old calendar sheets somewhere. Just divide a calendar sheet into three equal strips. If you use other paper cut it into strips about as long as a pencil and a quarter of a pencil length wide. 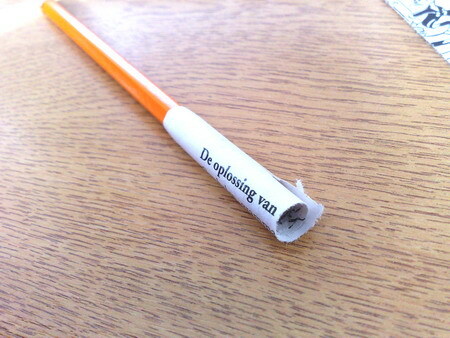 Roll the paper around the pencil and fix it with sticky tape. To increase stability you might want to close one end of the cylinder you just created. Either fold the end over and fix it with stick tape or just use sticky tape to close it without folding the end over. Some pencils, like the Staedtler Wopex, have a rubber-like surface which is nice when as it gives you more grip but makes removing the point protector difficult. In this case just put some sticky tape on the inside of the protector to reduce friction. The point protector protect the point of your pencil and will help to keep the inside of your pencil case graphite mark free. Now why didn’t I think of that? 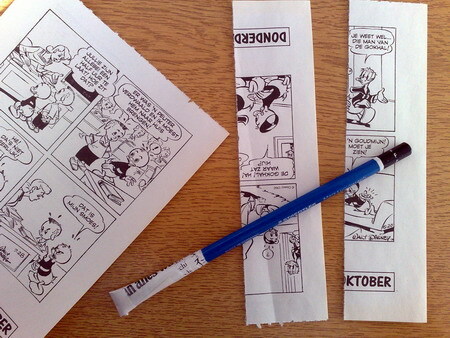 If I do this right, I can make point protectors of my favourite cartoons (it will make some meetings less boring 🙂 ), it will also make it easier to cheat at exams- the possibilities are endless – thanks. Now I just need to solve the problem of adding a clip. I know Lexikalerker’s useful tips – this tribute is well earned. I hope you’ll also use some Anders And cartoons 🙂 Adding a clip is a good idea. Let me know if you find a solution. 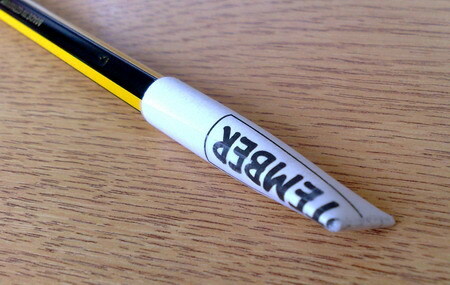 I like alliterations and Basteln mit Bleistift is a great name! If I ever translate the blog this will be the name for the handicraft articles. Thank you very much for that tribute – I feel honoured 🙂 And of course I am happy to see that my tinkering can be stimulating (but the synthesizer pencil was not my creation; I have only bought the kit and swung the soldering iron). Your idea and the presentation is great!